Taste test: These are white tortilla chips with the usual Doritos nacho cheese flavor powder on them. But because these are "natural," they somehow made them so that I couldn't see as much powder on them as with the normal variety. 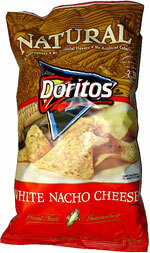 The chips were as crunchy as ever and will remind you of the regular Doritos Nacho Cheesier flavor. The best way to eat these is to lick the powder off first to get the full nacho cheese taste before biting into the tortilla chips. Doritos fans have nothing to worry about eating these  the bag said "natural," but the chips didn't taste any different. Smell test: They smell like plain tortilla chips or taco shells when you open the box. 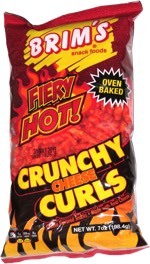 This snack was discovered by Keith and Melissa at Stop & Shop. Review published .